Honda Fit is a 5-door hatchback that was revealed in Japan in 2001 and is now in its third generation. Fit has a front mounted engine and comes with both, front wheel drive and four wheel drive versions. The hybrid version of Honda Fit was launched in Q4 of 2010 in Japan. 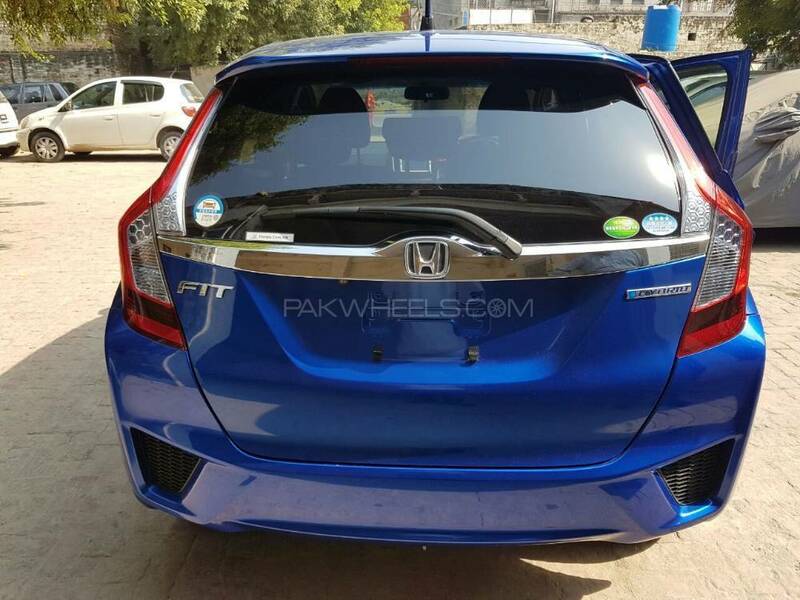 Honda Fit was released under Jazz nameplate in rest of the world. The first gen Honda Fit was discontinued in 2008 after its launch seven years back in 2001. The second generation was introduced in 2007, and then it was killed in 2013. The car we had for the test drive was a 2014 Honda Fit Hybrid. And we would like to thank Haris Automobiles in G8 Markaz Islamabad who were generous enough to lend us this car for the test drive. If you are after a used Japanese car in twin cities, do pay them a visit. Base Grade, as the name suggests, is the most basic variant whereas the S Package is the top of the line. The car we had for the test run was an F Package. As far the dimensions of the car are concerned, Fit hybrid is 3955 mm long, 1695 mm wide, and its wheelbase measures at 2530 mm. Since we are comparing Fit to its direct competitor, Toyota Aqua measures at 3995 mm in length and 1695 mm in width, exactly the same dimension as of Honda Fit. Honda Fit Hybrid is however 1525 mm in height, compared to Toyota Aqua’s 1445 mm. Fit has also slightly shorter wheelbase than the Aqua (2530 mm vs. 2550 mm). That is less than an inch. At first glance, the car looks like a small station wagon. I would say this because from the side if you look closely, you get a short front end yet a long passenger cabin. It doesn’t look like a typical hatchback. The front looks shorter than its direct competitor, Toyota Aqua. Overall, the Fit looks a little plump as compared to Aqua. Toyota Aqua looks sporty and sleek. Honda Fit looks like a fat car pretending to be sporty. The front end looks like a distinctive Honda design. 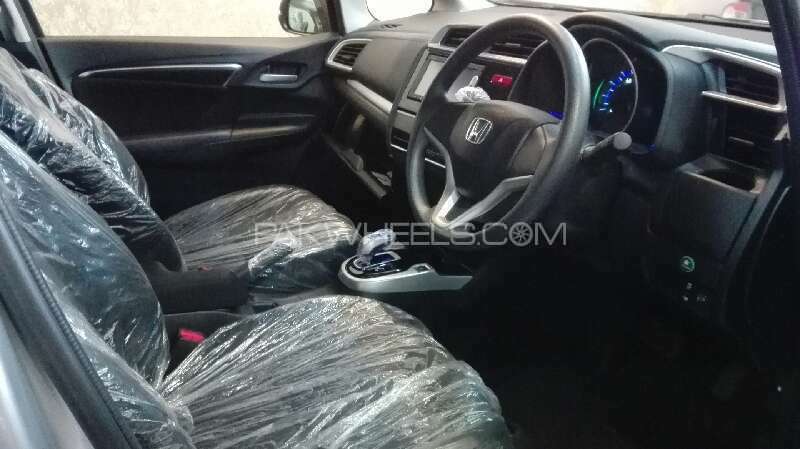 It looks much similar to Honda Vezel and other modern Honda cars. 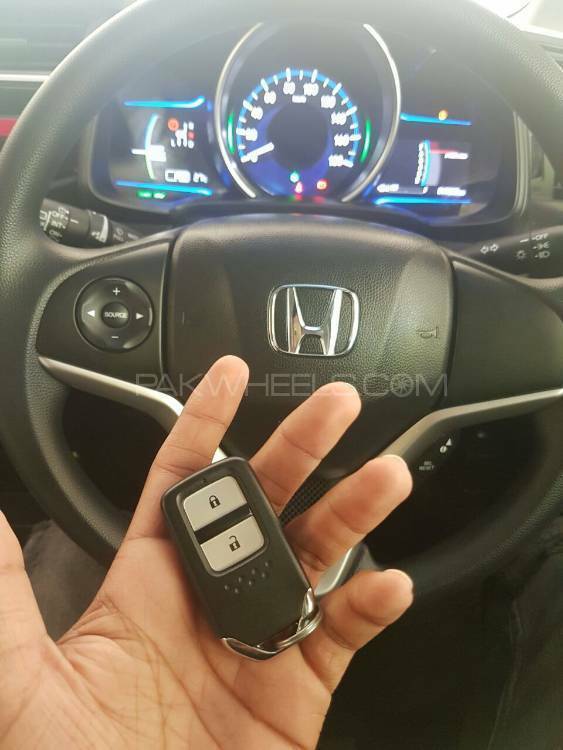 Even the new 2016 Honda Civic has borrowed a few curves, cuts and bulges from Honda Fit and Vezel. The front is made up of black plastic mesh, silver bumper and a bit of chrome. You get a wide front face; the upper grille stretches from headlight to headlight. Below the number plate mounting points; you get another black mesh design piece of plastic with fog lights in both corners of the bumper. The bonnet makes a swooping appearance combined with the windscreen that has the similar angle to the car. The sides are pretty simple except the deep gash that runs from rear lights of the car to the front doors under the rear view mirrors on both sides. The rear also doesn’t pose as such any drama. The most prominent thing at the back if the car is its brake lights. Half of the brake lights are mounted on the body, and there is a small portion mounted on the boot lid of the car. You get a big rear bumper with two mesh design plastic covers in the bottom area of its corners. On the rear hatch, you get a narrow rear windshield just like Toyota Aqua, and during the drive, I didn’t find the rear screen to be adequate. Although it’s slightly better than Aqua yet you miss a few things while backing the car. The interior of Honda Fit gives a premium feel. The materials and plastics used in the making of the cabin feel fine and classy. In fact, I was pleasantly surprised with the build quality of the Honda Fit interior. As compared to Honda Fit, its competitors fall behind in terms of the interior build quality. The plastic used on the door panels and the dashboard doesn’t feel cheap or tacky. 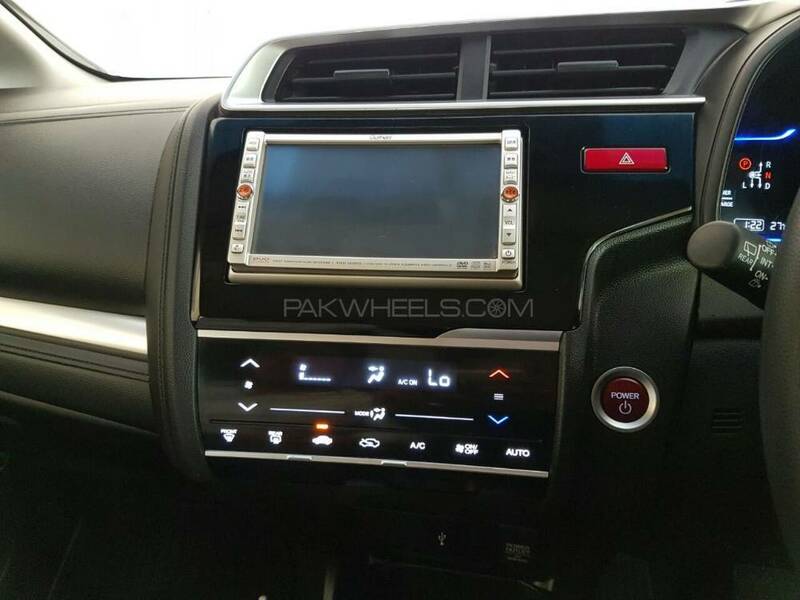 In our Honda Vezel test, we talked about the cheap feel of the top portion of the dashboard. This is not the case in Honda Fit. The fitment might need a little work, but you can blame the slight gaps and misaligned dashboard panels to the rough use of the previous owners or transit damage. But overall, I was genuinely impressed with the way Honda has designed the interior and its build quality. The dashboard is pretty simple. There are bits of chrome and silver color here and there. But other than that, the dashboard along with the rest of the interior are shades of black and grey. The top of the dashboard is covered with faux leather and is definitely nice to touch. But considering how hot and humid it gets in Pakistan, one can only imagine what would happen to the material if you park the car for long period of time in direct sunlight. Talking about the design of the dashboard, it is contemporary Honda design. It gives a sporty look and has a very to-the-point feel. There are no unnecessary curves and designs. You get nice clean portion in front of the passenger side with a glove compartment in front. In the middle, you have your audio unit which probably won’t work since its Japanese. Under the head unit, there’s touch panel for climate control. You can adjust the inside temperature as well as demister in the rear and front. You do however get that same Honda dashboard that is like foot and a half deep. To make the fronts of the car shorter, automakers then place the A-pillars right next to front shock absorber foundation, pulling the windshield over almost half of the engine bay. This leads to the need of extending the top of the dashboards as well. This is typical for most of the modern cars. The driver gets the fully focused cluster panel in front with all the necessary information; from the speed of the car to what gear you are in, and other specific information that you can change with the button on the steering wheel. 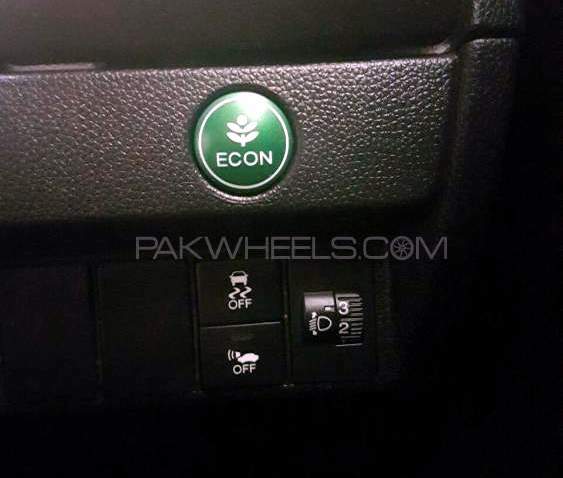 The start button lies on the right of the steering wheel whereas on the right side of the steering, there is ECON button along with the traction control button, radar button, fog lights button, and headlight adjustment. There are two power outlets, one is under the dashboard in front of the gear lever and the other is in the center console. Remove the lid of the center armrest and you will get access to the outlet. Also, there is a space for two cups right under the dashboard in front of the gear lever in the middle console. You get four speakers in Fit, one in each door. Seats, both the front and rear, are made up of two types of fabrics. The center part is made up of perforated type cloth to lessen the heat and sweat; the sides are made up of an artificial type material. I am personally glad Honda has used fabric in the car. It makes the car easy to ride especially in the scorching summers. As mentioned above, Fit comes with basically black and grey upholstery. And if you compare that to Aqua, the Aqua comes with light colors that not only appear nice but also make the inside of the car more pleasant. The Honda Fit interior might start to feel boring after a few months. On the downside, Aqua’s interior being light in color, can easily and quickly get dirty. Black upholstery, on the other hand, is very generous and makes the car look clean even when its not. The seats, on the whole, are comfortable and support the passengers nicely. 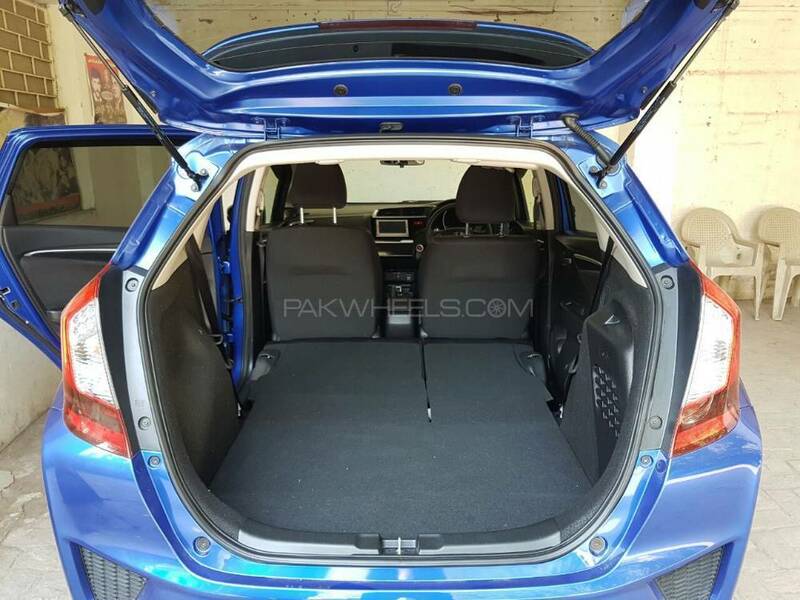 There is a slight hump in the middle of the rear seat that can make it a little uncomfortable for a long drive but other than that, rest is well made and well thought of. The backs of both front seats are wide, and bottom parts stay in place when cornering. All the padding and overall improved build quality means you don’t get much of the outside noise in the road. The car itself is quite. It is not as quiet as the Aqua (Aqua is eerily quiet in normal conditions), but it is quiet enough. You do get nice engine roar when you wake the car up with the accelerator. Secondly, the well-tuned suspension makes the road noise disappear as well. Not once did I feel during my test that I need to raise my voice to talk to the fellow passengers due to outside noise coming inside the car. Just like Vezel, the gear lever is tiny. But it does what it’s supposed to. Toyota was the first to bring such electronic knob to put the car in drive when they launched the 2nd generation Toyota Prius. I guess this is the future of the cars; no more massive sticks poking from the floor of the car. The gear lever gives four options. Push it straight down and you will engage the low gears of the car. Whereas if you slide it to the right, you have options to put the car in reverse, neutral or, in the drive. Next to the gear lever, you will find S Mode button. Next to the armrest in the center console, you have a proper manual handbrake. And next to the lever, there is a button for electronic parking as well. 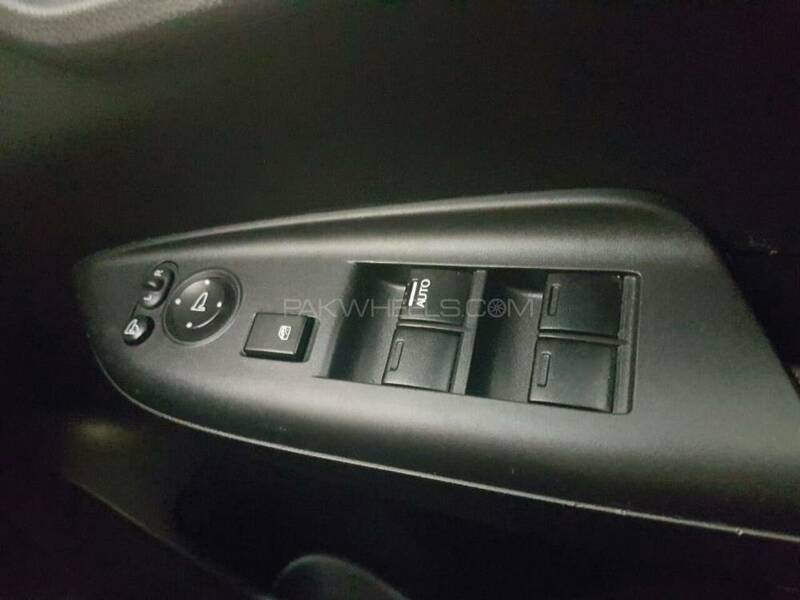 So the Fit comes with both types of parking brakes, a proper handbrake lever as well as a button like you get in Honda Vezel. I consider myself old school, and I still prefer those manual handbrakes over buttons. I am glad both Honda and Toyota have stuck with manual parking brake in Fit and Aqua respectively although Fit has e-brake as well. The electronic brake disengages the moment you put the car in drive. If I have to describe Fit’s driving experience in few words, I must say Fit Hybrid is a lovely car to drive. It’s very exciting and sporty to drive. 2014 Honda Fit Hybrid comes with a 1500 cc internal combustion engine mated to Honda’s dual clutch seven-speed gearbox. Since Fit hybrid is a parallel hybrid, you get the electric motor/generator between the engine and the transmission. Fit Hybrid makes combined power of around 135 hp and 170 Nm of torque. The electric motor on its own makes 30 peak horsepower. The fact that the car weighs a little over 1100 kilograms, the combined power of the engine and electric motor makes the car fun to drive. The dual clutch seven speed works perfectly and I am glad Honda didn’t bother with those paddle shifters behind the steering like Honda Vezel. The car on it manages the gears and engine power perfectly. No need to be a professional racing driver and change the gears on your own. 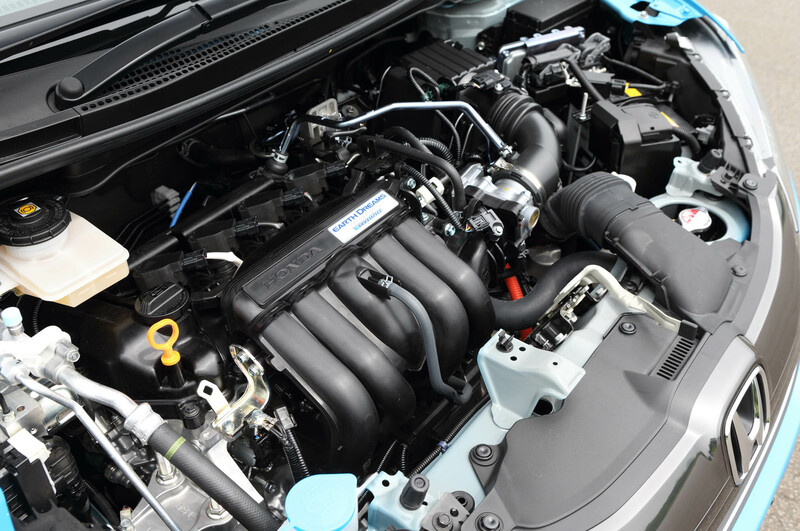 Fit hybrid comes with what Honda calls IPU (Intelligent Power Unit). The electric motor is powered by the lithium-ion battery pack. All of this comes together and gives you such a fantastic ride for such a small car. There is no delay in throttle response as you would feel in a CVT car. Since the car has a dual clutch gearbox, gear changes are quite quick and seamless. You just gun the race paddle down, and the car starts jumping the gears and adding the kilometer per hours on the speedometer. The Fit Hybrid comes with what Honda is calling Sports Hybrid Intelligent Dual Clutch Drive (i-DCD) gearbox. At 110 km/h, the car felt effortless. There was no engine noise, or the feeling of high revs. The car’s power management system manages the internal combustion engine and electric motors in such an effortless way that when I pressed the race paddle to the floor, the car jumped into action and started gaining speed instantly. There is no delay in the power band. The Fit Hybrid just lowered a gear instantly and started speeding up. Being light in weight and having a powerful engine mated to such an advanced hybrid unit and gearbox, the Honda Fit Hybrid can do 0 to 60 mph in just under 9 seconds. Since it’s a Japanese car, you won’t be able to make it cross 180 km/h. Honda claims the car does 36.4 kilometers per liter, which is a bit preposterous if you ask me. It might be possible in the strictly controlled testing environment, but no way can you achieve even close to that. Think it yourself, how is it possible get this much when driving on Shahrah e Faisal in Karachi or Murree Road in Rawalpindi. During my time I was driving it, the car gave fuel average of 18 km/l when cruising at 100 km/h and Econ mode on. I am sure the car would have achieved better than that had I been gentle with the race paddle. But still, the 40-liter fuel tank is going to last you pretty decent amount of kilometers especially if you are driving in Econ mode. In Econ mode, the car lowers the output and prefers the electric motor over the internal combustion engine. The Econ optimizes the shift point of the transmission. Econ is there to provide you as many miles to the liter as possible. Taking about braking performance of the car, the car comes with 4-wheel disk brakes and ABS. The suspension of this car has been tuned really well by the Honda. The result is the impressive braking performance of this hybrid hatchback. As many other hybrid vehicles, Fit Hybrid also comes with regenerative braking, or in Honda’s case, electric servo braking system. Basically, the point is to use the energy produced when braking of the car to recharge the battery. That means when you take the foot off the accelerator, car’s IPU applies brakes to recharge the battery. Honda cars usually have better stopping performance than their main Japanese rival and same goes for the Honda Fit Hybrid. One thing that did disappoint me was the performance of the A/C. It’s just not efficient enough. I had the same experience in Honda Vezel, and now the same thing in Fit. It doesn’t matter if you turn the Econ off or on, the A/C didn’t perform as well as I had hoped for. Turning the Econ mode ON only made it worse. Since Econ is supposed to bring you best fuel average, it turns the overall output down. It was 44 degree Celsius when I had the car for the test drive. The A/C did manage to cool the cabin down eventually, but it took way too long than one would like. Like Toyota Aqua, Fit Hybrid also comes with an electric compressor. As far the interior space is concerned, Honda Fit is more spacious than its direct competitor Toyota Aqua. Although Fit has slightly shorter wheelbase (0.7 inches) than the Aqua, somehow Honda has managed to produce more leg space in the rear than Toyota. And I believe that has something to do with the placement of the battery pack in the car. Also, considering Fit is taller (around 3.1 inches) than the Aqua, you get more headroom as well. 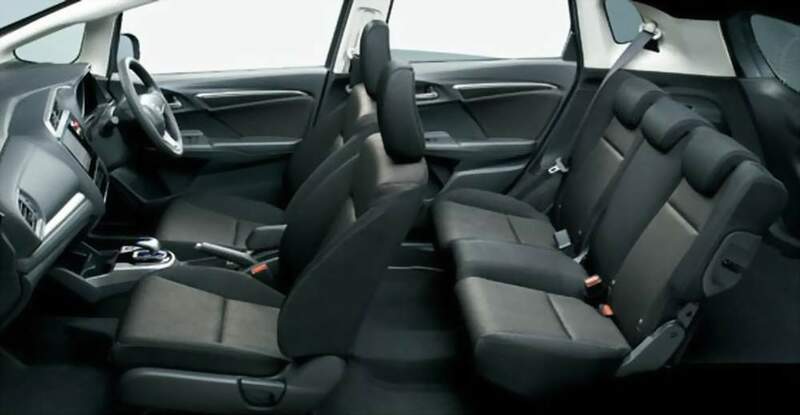 Fit Hybrid comes with what Honda calls Magic Seats. Basically, you can completely fold them to make a flatbed loading bay in the back of the car. The boot space of Honda Fit measures at 354 liters. That is more than any other vehicle in its class. Even without folding the seats, you get nice big boot in the back. Since Honda has placed the battery pack where a spare tyre usually is in the boot, all you get is a puncture repair kit in case you face a flat tyre. As mentioned above, Fit is 3 inches taller than Aqua, and that means decent headroom all around. For a person with 6 feet height, you can easily sit in the rear without the fear of bumping your head to the roof. Also, the doors of the Fit open to almost 90 degrees. It gives great accessibility to get in and out of the car. So if you are tall or wide, getting in and out of the car won’t pose any problem. I adjusted the front seats according to my driving position and style, and there still was very decent leg room in the rear. The seating is comfortable and relaxing. Even though the Fit is a little shorter in wheelbase than the Aqua, its ride quality is far superior to the Aqua. We took the car to a broken patch of road and car glided over the potholes and humps comfortably. I was presently surprised with how the car drove on a bad surface. Honda usually has a stiffer suspension in its cars, but even being stiff, the Fit is more comfortable than its competitor. The cabin is pretty soundproof and considering the decent suspension setup makes this car a breath of fresh air. Honda redesigned the torsion beam in the rear, and that has made the car more responsive. In the front, you get typical MacPherson strut setup. I think Honda has struck gold with the suspension design and overall ride quality of the Honda Fit. At high speeds, waiving the car around didn’t make it lose its traction. The car stuck to the ground and gobbled bumpy road like a well-tuned sedan. The belly of the car is only 5.3 inches above the ground. Although this is a decent road clearance if there are a couple of people in the car. But it can be an issue with four adults and some baggage in the boot. You will need to be careful taking the car over bigger speed breakers. But that low road clearance also helps in improving the overall handling experience of the car. You get a nice planted feeling at high speeds in Honda Fit, which was absent in the case of Toyota Aqua when I drove it. I can say it with confidence that Honda Fit provides better high-speed road grip and confidence level than Toyota Aqua. At 120 km/h, I swerved the car around on an empty road, and not once did I feel that I will lose the control of the car. 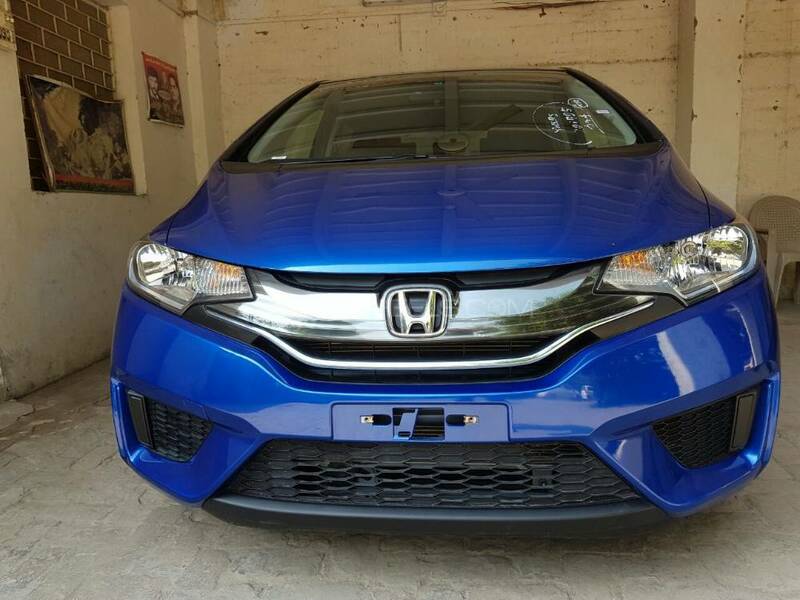 Honda Fit has very sporty feeling to it; from the engine to the gearbox and the suspension, all help you enhance your driving experience. The car loves to go around twisty, hilly roads, and you will love the feeling as well. One thing that did disappoint me was Fit Hybrid’s turning radius. Honda Fit Hybrid turns at 4.9m, which is worse than Toyota Aqua. Toyota says Aqua’s turning radius is 4.8m. Toyota Vitz has far better turning radius than these two; 4.4 meters. The steering wheel on its own feels good to hold, and you feel comfortable maneuvering the car in the traffic. It’s EPS of course, and has been very well tuned. I found Fit’s EPS better than Aqua’s EPS. Aqua’s EPS felt dead and vague in feedback whereas Fit’s EPS feels well-tuned and precise. If you like your car to interact with you, you will definitely prefer Honda Fit Hybrid’s steering. The steering wheel is both tilting and telescopic so you can adjust it the way you want. You also find information display button on bottom right of the wheel from where you can select various car related information to appear in the meter in front of you. As with any other modern Japan-assembled car, Honda Fit Hybrid comes with all the basic safety features. The top of the line Fit Hybrid has a whole more to offer, but the F Package is also adequate. You get two airbags in the front (Front seat i-side airbag system) and side curtain airbags as well along with the seat belts all around. You even have a belt in the rear for mounting a child’s seat on the rear car seat. Then there is radar system, or what Honda calls ‘City-Brake Active System.' Basically, it prevents you from rear-ending a vehicle in front. The system when turned on works at slow speeds (between 5 km/h to 30 km/h). When the radar system detects an object in front of the car, it cuts the feed to the race paddle and automatically reduces the speed of the car. Also, Honda Fit Hybrid comes with a traction control. 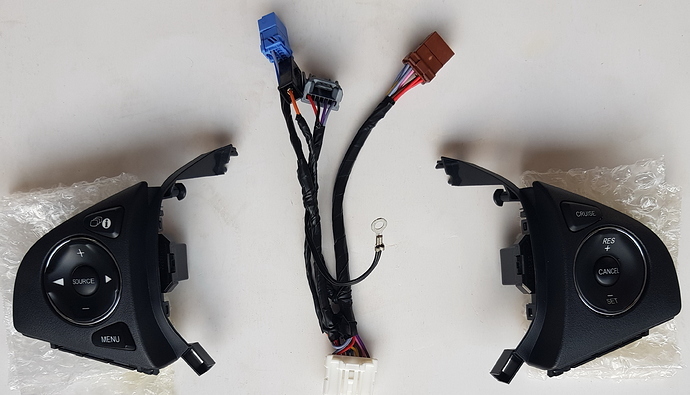 In the case of traction loss, the ECU detects the car losing its ground assists the car to apply brakes and come back in its tracks or cut the power to the slipping tyre to make sure it starts gripping again. And you get the usually ABS as well. Considering the car has regenerative braking, the braking capabilities of such cars are already quite decent. 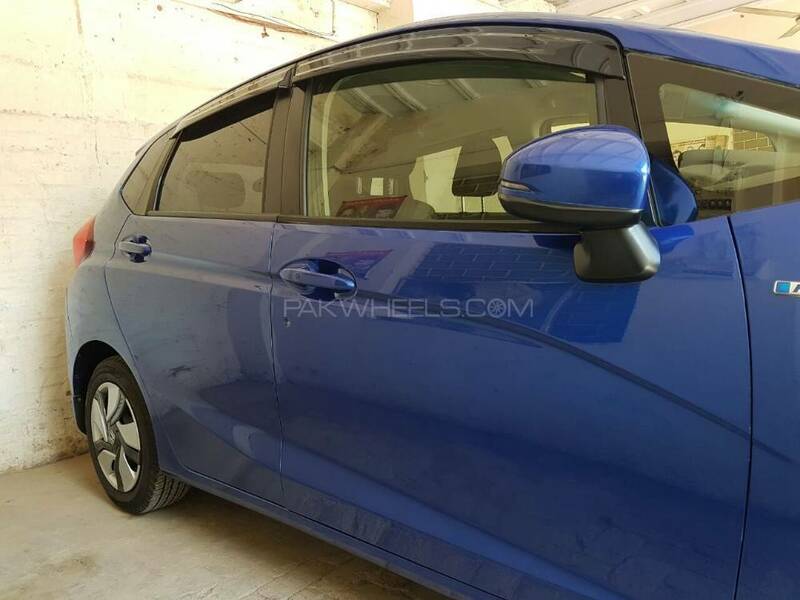 And you get crumple zone in both the front and the rear of Honda Fit Hybrid. It’s a perfect family car for a 2+2 family. It’s small, and relatively cheaper to run since it’s a hybrid, and has pretty decent room inside. And it looks nice as well. I think this car can perfectly work as a one-and-only car in the household, and you won’t have a problem in terms of fitting people inside or going on long routes. The car is designed well and is comfortable on long routes. So no problems there. And it’s sporty enough to have some weekend fun on a hilly tourist destination. But the question is should you get it? 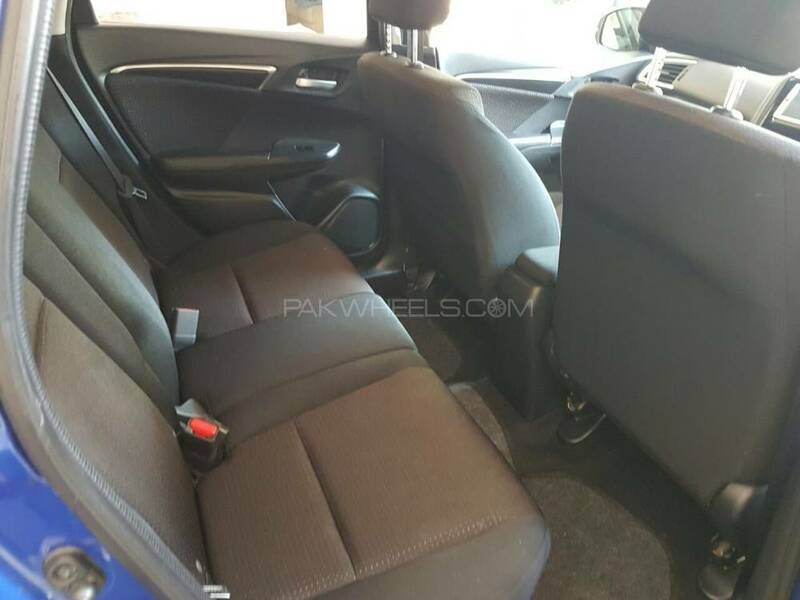 This particular Honda Fit that I had for the test was priced at PKR 1.8 million. That is a lot of money in my opinion. So as much as I like this car, I cannot justify the price tag. 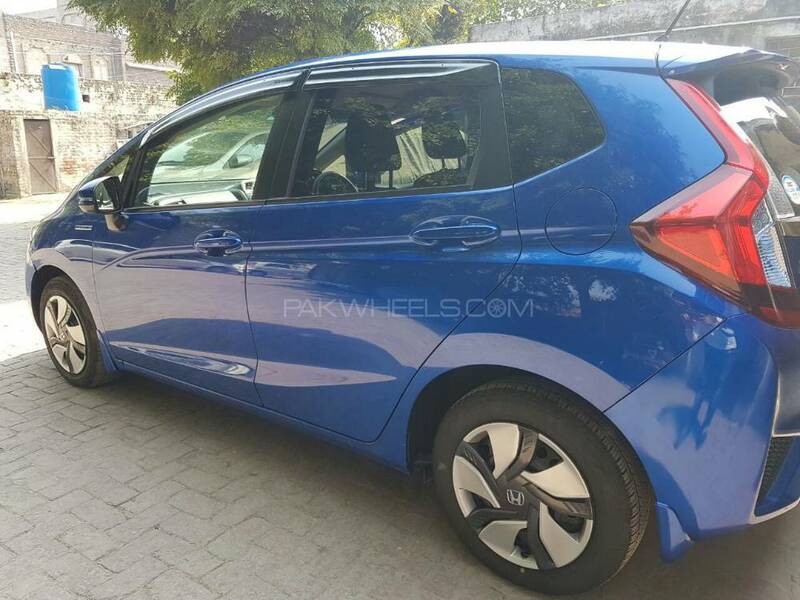 Had 2014 Fit been around 1.4 to 1.5, or even 1.6 million for the top of the line Fit Hybrid, I would urge our readers to prefer this over anything in this budget. But unfortunately, the price makes it a hard sell. And I understand the importers and dealers have to pay a lot of taxes, and there is only so much they can do to reduce the price while keeping a decent profit margin, Prices of Fit Hybrid can go as high as Rs2 million. That is just bonkers if you ask me. You can definitely find a cheaper Fit Hybrid, but there are chances the car being in bad condition. All I can say in the end, the Honda Fit Hybrid is a whole lot of car in equally a whole lot of money. I bought my GP5 exactly 1 year ago to date. The best decision i made. It's one of the most comfortable and fuel efficient rides. I have a Honda Fit Hybrid 2nd generation. 97000km driven. In good condition, used to have Toyota Aqua before, but sold it and bought Honda fit hybrid. So after driving both of these for quite a while, my opinion about both of them and the main differences are as follows. Toyota Aqua has gives you better mileage / litre when compared with Honda Fit Hybrid. Toyota Aqua gives you almost 22 ~ 24km / litre whereas honda fit hybrid gives you 18 ~ 20km / litre on low speed up to 100km/h even if its running on economy mode. Toyota Aqua has very stiff suspension compared to honda fit hybrid. Toyota Aqua speed, acceleration and agility is a bit better than honda fit hybrid. 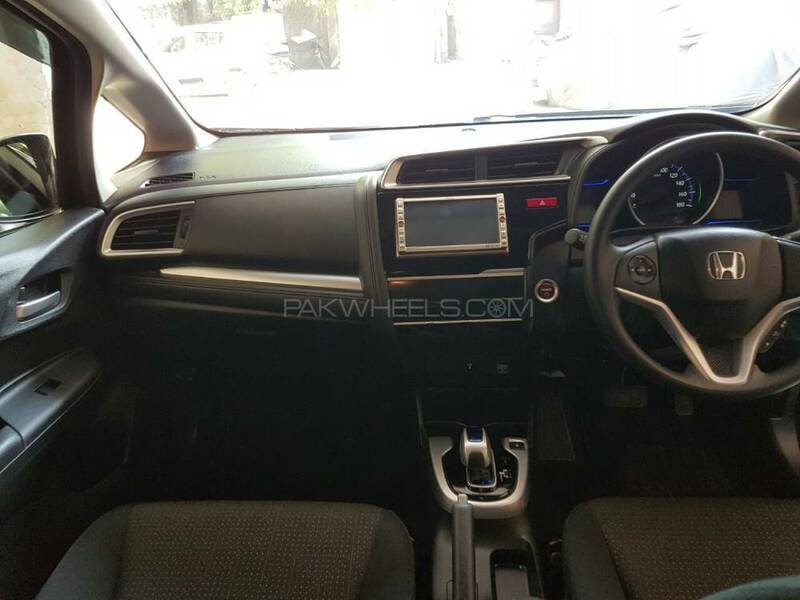 Toyota Aqua has pathetic interior when compared with honda fit hybrid. It can charge its self because its hybrid, and believe me you did not find any local car near to this in this price range. I have Honda fit L package and it gives me fuel average of 24/l on long routes with speed 100km/h to 120km/h and eco mood on.